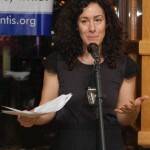 Joanna Smith Rakoff | Pen Parentis Literary Salons | Parenting Done. Write. I write Novels, Creative Nonfiction, Poetry. Joanna Smith Rakoff’s novel, A FORTUNATE AGE, was a New York Times’ Editors’ Pick, a winner of the Elle Readers’ Prize, and a selection of Barnes and Noble’s First Look Book Club. She has written for the New York Times, The Los Angeles Times, Vogue, O: The Oprah Magazine, and many other periodicals. Her poetry has appeared in The Paris Review and The Kenyon Review, among others. She lives in New York with her husband, son and daughter.